Here’s a quick run down of the ingredients that comprise this protein rich, yet powder and supplement free smoothie. Kefir: Very rich in protein. Exactly how much is hard to say because of many factors, including whether it was store bought or made at home, what kind of milk was used, and how long it was fermented. Avocado: They don’t contain a substantial amount of protein, but do have the highest protein content of any fruit. Greek Yogurt: A typical 6-ounce serving (3/4 cup) contains between 15 and 20 grams. This is the equivalent to the amount of protein in in 2 to 3 ounces of lean meat. Chia Seeds: A one ounce serving of chia seeds contains about 4 grams of protein. Goji Berries: The highest protein content of any berry, 1/4 cup serving of goji’s contains about 4 grams of protein. Gelatin: A relatively new smoothie ingredient for me, gelatin is pure protein with an impressive amino acid profile. One amino acid in particular it’s rich in, glycine, assists the liver with detoxification. The best gelatin for my money is the Bernard Jensen 100% Pure Gelatin, which you can find on Amazon. It contains 12 grams of protein per serving (1 tablespoon). By combining all of these moderate to high protein ingredients you get a nice, natural protein-packed smoothie. Of course you can always add your favorite protein powder if you’d like. Enjoy! I’d love to know if you tried this natural protein smoothie – please do tell in the comments below. Happy Blending! This is sort of similar to the smoothie I base play around with after a workout (although, as I mentioned previously, I use that Skyr thing). What I wonder about, with your recipe, is that it should probably have more simple carbs, if people want it for muscle growth, right? I tend to use a banana, a bit of goji juice and perhaps a pear or a couple of dates or a bit of (organic) honey, to try to get some simple sugars in mine to speed up the healing process of my muscles. On that note, I also use chia seeds in mine, but I’ve been wondering, would that slow down my recovery, do you think? Because of it’s high fiber content? Just a thought. More simple carbs for muscle growth – I’m really not sure about that. I know some people avoid carbs all together and go with essentially straight protein to maximize recovery and growth after a workout (weight training). I like the chia seeds and avocado for thickness and to help prevent the smoothie from running right through me to increase absorption and assimilation. This smoothie really is more of a protein-packed meal replacement. For post workout, I would remove the chia seeds, or cut way down, and avocado. Actually, a credible source recently told me that raw milk is the best thing to consume about 10 minutes after a workout. I’ll often drink a glass of milk, then whip up a smoothie and be set for a while. Everybody is different, so it’s probably best to play with it and see what works best for you. 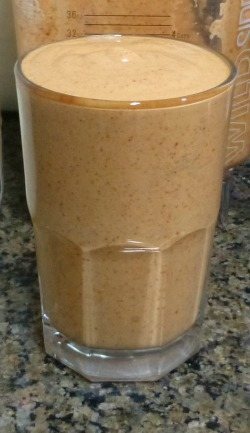 I normally work out in the morning, so my post-workout smoothie is also my breakfast (I’ll just have a bit of rye crispbread with a little peanut butter and a slice of pear before working out, to calm my stomach down). I think I’ll just keep on doing it the way I’ve been doing it. It’s working out pretty well for me thus far. Hope all is well. Just updated this smoothie with a new protein source you might like, gelatin. It’s what you get from bone broths, but who has time to make and consume bone broth every day. I’ve been using it for over a month and really like it. I just started getting into smoothies. So far I started with 1/2 frozen banana, 1 cup of pineapple juice, some mango pieces, blueberries and a one tbsp of morenga powder. This smoothy doesnt have a name yet. I have also substituted cranberry juice for the pineapple juice. My question would be. I am looking for a smoothy that would help me put weight on. I am 15 lbs underweight right now, and looking for something really fattening. My loss was due to a couple of stressful years. Thanks so much for this. I can’t wait to read it, and will keep you posted of what I have tried and learned. I just want to get the newsletter and free E-book. and Thank You. this is all new to me and I need healthy but cheap recipes. Confirm your subscription to my newsletter and you’ll get instant access to my e-book, Tom.